Help us Paint the Map Purple! Although patients and their families recognize sarcoidosis to be a devastating illness, more volunteers are needed who will join us to advocate for awareness. There is much work to be done to determine the cause, exact prevalence, and best treatment protocol for sarcoidosis – it is unacceptable that many patients have to suffer for years before receiving the correct diagnosis or proper treatment. An easy way to get involved and raise awareness for sarcoidosis is by obtaining a proclamation for Awareness Month. A proclamation is essentially an official, signed document proclaiming that your local or state government recognizes April as Sarcoidosis Awareness Month. Our proclamation toolkit makes being an advocate for more awareness among local and state officials easy! In many states, securing a proclamation is as easy as a Google search and a form submission. 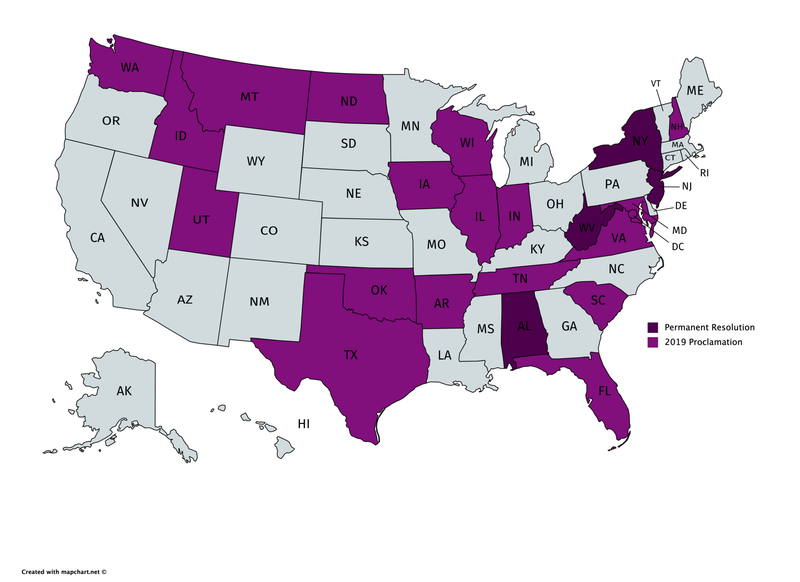 We are trying to turn the entire map purple by April 30, 2019! Fill out the form below if you are working on obtaining a proclamation or plan to for April 2019. This way, we can be aware of which states already have proclamations in the works and which we need volunteers for. We can also connect you with others in your area so you can collaborate on any work that needs to be done to obtain the proclamation. Let us know once you’ve obtained a proclamation for your state and we’ll paint your state purple! Please note that some states may say that instead of a proclamation they will only draft letters of support – please encourage them to do so and we’ll paint the state purple on the map. The name of the city, county or state where the proclamation would be obtained. If you are trying to obtain multiple, please list them all. Have you ever gone through the process of applying for a proclamation before? Are you just getting started? Have you researched local requirements for proclamations? Do you have any preexisting relationships with your government that might help your process? To connect you with others in your area for collaboration, which method of communication would you prefer?Your information will never be posted publicly. Now, therefore, I, _____________________________, do hereby proclaim April as Sarcoidosis Awareness Month. In Witness Whereof, I have hereunto set my hand and caused the Great Seal of _________________ to be affixed. Done at _________________ in the _________________________________ this _____ day of ________________ in the Year of Our Lord two thousand ________. Learn other ways in which you can raise awareness.